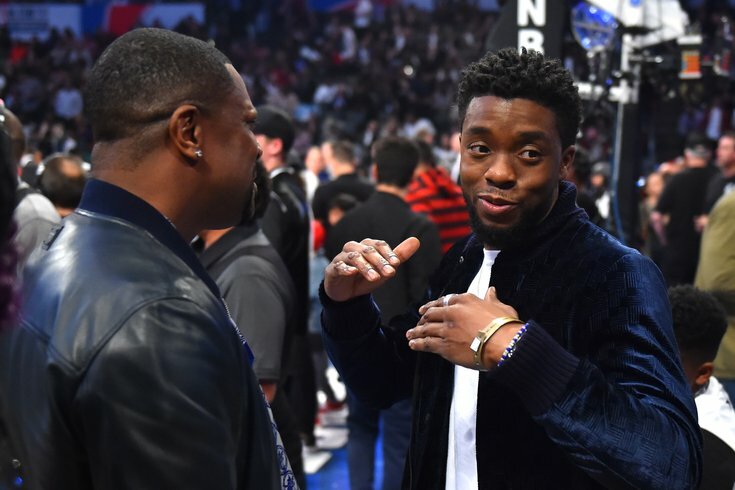 Chadwick Boseman, right, star of the upcoming film '17 Bridges, is seen here with Chris Tucker in a photo taken in February 2018. Boseman and film crews with '17 Bridges' were in Philadelphia recently shooting scenes for the movie. The latest movie to shoot in Philadelphia, this one with "Black Panther" star Chadwick Boseman in the lead, was spotted filming in Chinatown and near the Pennsylvania Convention Center late Monday night and into Tuesday. The film is "17 Bridges," and crews were first spotted in Philadelphia over the summer, around the time a casting call went out looking for local extras, saying they would need to be available starting Sept. 24. 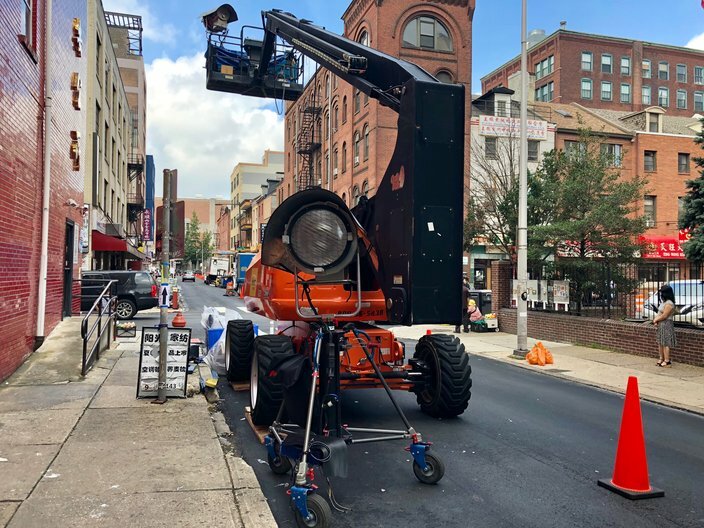 Lighting equipment used during the filming of scenes of Chadwick Boseman's upcoming film '17 Bridges' was being stored on the 900 block of Cherry Street in Chinatown on Tuesday. The movie, though set in New York City, is being filmed in Philadelphia. 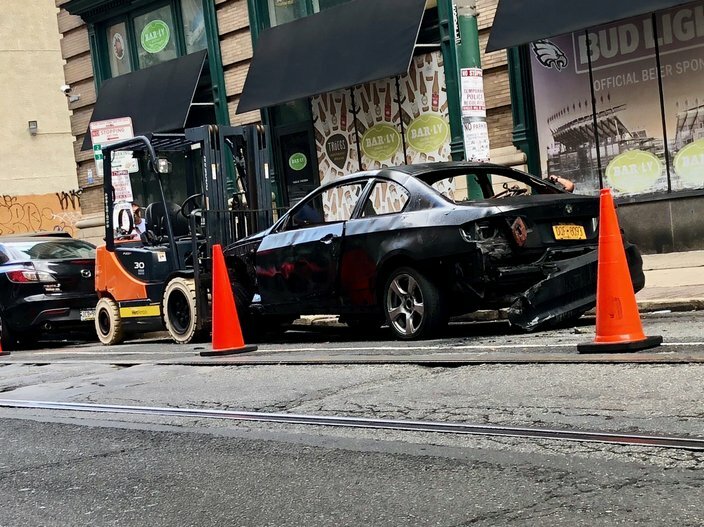 A wrecked car being used during the filming of scenes of Chadwick Boseman's upcoming film '17 Bridges' was parked on the 110 block of North 11th Street in Chinatown on Tuesday. The movie, though set in New York City, is being filmed in Philadelphia. 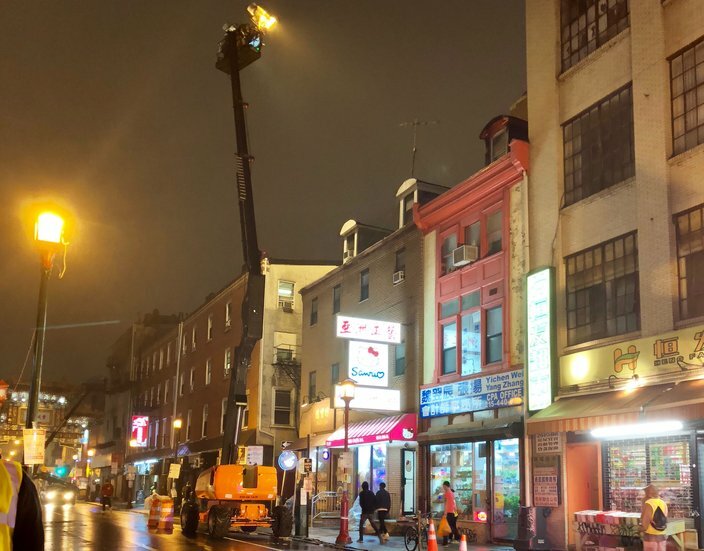 Film crews shooting scenes for Chadwick Boseman's upcoming movie '17 Bridges' filled the 1000 block of Appletree Street in Chinatown on Monday night. The movie, though set in New York City, is being filmed in Philadelphia. Last week, crews were also seen near 11th and Callowhill streets, throwing some people for a loop because of the NYPD cars and yellow New York cabs. Crews previously have been spotted in Rittenhouse, where an apartment at 2013 Locust St. was used as the residence for character Lucky played by Sienna Miller. "17 Bridges" is set in Manhattan, with Boseman playing a disgraced NYPD detective who uncovers a mass conspiracy and begins a citywide manhunt for two killers. The action-thriller is directed by Brian Kirk, best known for his work on "Game of Thrones." The film recently announced the addition of Stephan James to the cast, as well. Some filming for the production also is taking place in New York. The scheduled released date for "17 Bridges" is July 2019.